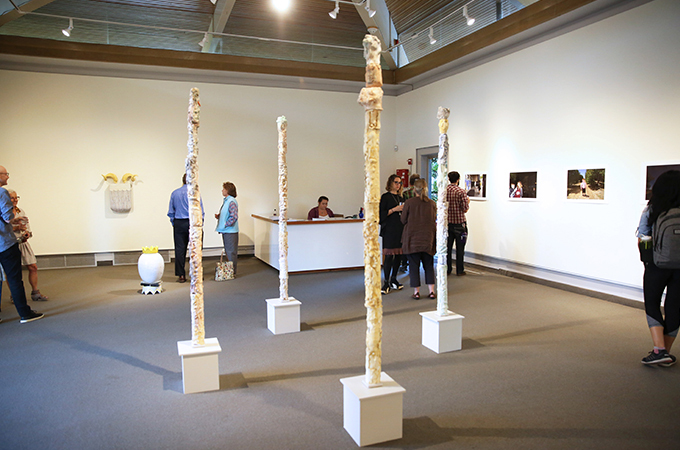 The Art Faculty Show is open at the University’s Gallery Building until Sunday, October 22. The annual Art Faculty Show opened this week, featuring work from the U of R’s own art faculty, and I was yet again pleasantly surprised to see what they had in store. As an art student who has worked with most of these professors, I am always eager to see what they’ve been creating—the inverse of the usual arrangement in which they graciously observe and critique my pieces. A portion of 'The memory endures' by Raúl Acero, which reaches almost to the ceiling of the University Gallery. Four skinny towers, reaching nearly to the University Gallery’s ceiling, draw attention all the way from the sidewalk outside. 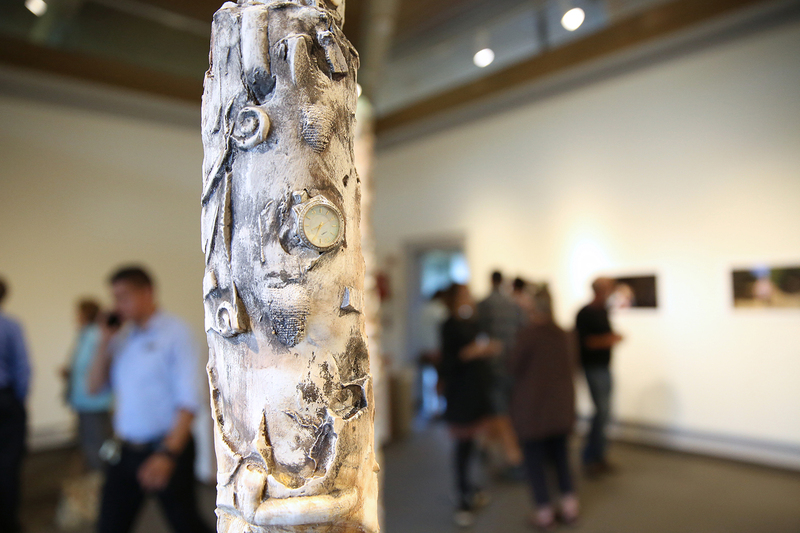 Sculpture Professor Raúl Acero’s The memory endures, created from plaster and found objects, allows viewers to weave between the towers and experience little bursts of intrigue at each new discovery of its intricacies, such as the watch I noticed embedded in the plaster. The gallery walls pop with color thanks to photographic contributions from Professor of Photography Tommi Cahill, whose photo series speaks of interactions between human beings, and Professor of Digital Imaging Jeff Wilson, whose enlarged portraits rival the size of the viewer. Munro Galloway, professor of painting, adds more color to the room with his mixed media drawings that, to my eye, are reminiscent of his Four Years series due to their multiple layers. Qwist Joseph, professor of sculpture whose class I took last spring, has three sculptures in the show, which he told me are newer works. 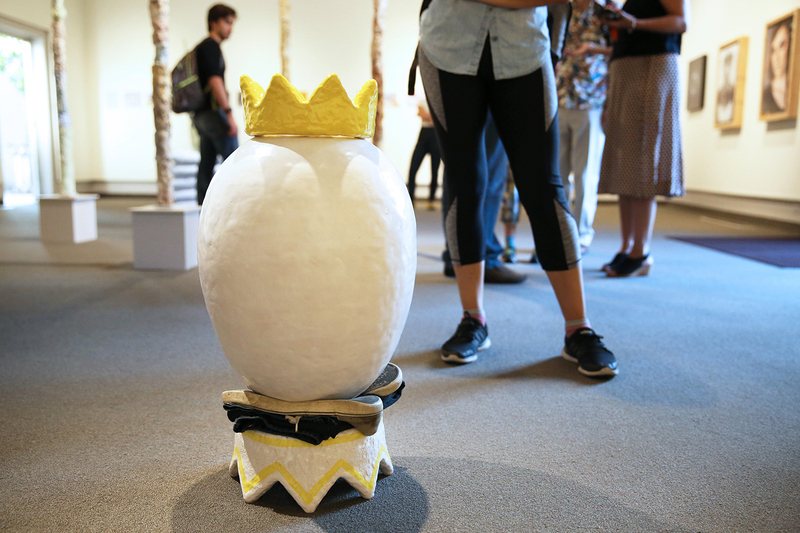 While all are certainly eye-catching, the one that really drew my attention depicted a crowned ceramic egg resting on pants and shoes. “My work is a lot about building up information and having automatic responses in the studio,” says Qwist Joseph, professor of sculpture. “I wanted to bring some of that energy and that space into this more cold, clean environment of the Gallery.” Pictured here is his sculpture titled 'Scaffold'. “All of these works respond to constant themes for me, which are memory and connections,” says Penny McElroy, professor of graphic design. Pictured here is her piece titled 'the hour of departure'. “I’m interested in how things overlay each other,” said Penny McElroy, professor of graphic design, of her multilayered pieces, which are extensions of the work she began last summer. 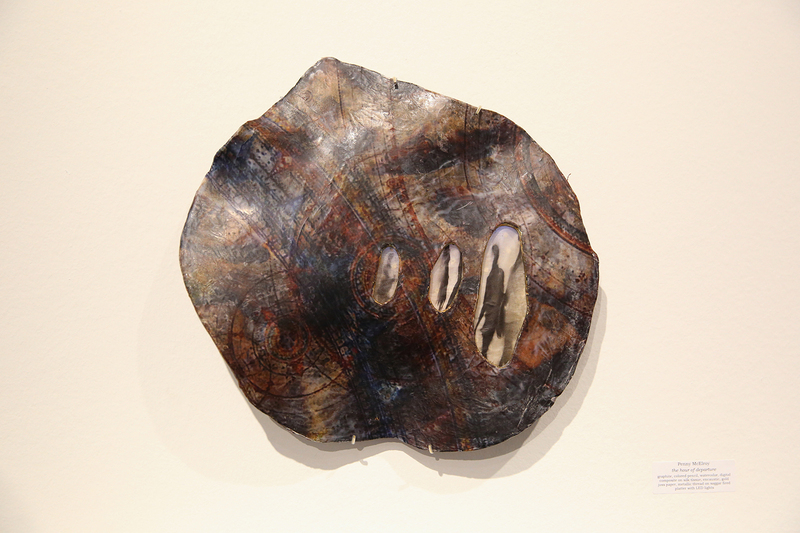 Layers are a common theme in her work, and some elements of these particular pieces include LED lights, silk tissue, colored pencil, graphite, and watercolor. The Art Faculty Show will be open at the Gallery on Colton Avenue until Sunday, October 22. It is open from 1–5 p.m. Tuesday through Friday and from 2–5 p.m. on Saturdays and Sundays.